Under the direct supervision of our licensed instructors, the riding program caters to the different levels of instruction based specifically on your child's ability. During daily riding lessons, campers work with an individual riding instructor who provides not only personalized attention, but encouragement for first time riders and challenges those who have ridden before. While awaiting their lesson, the group works with a care and management instructor who teaches the children the importance and responsibility of caring for horses. At the completion of each two week session, every camper receives a signature, commemorative photo while on horseback. For riding, all Day Campers are required to supply long pants and hard soled leather boots with heels (ankle high is enough). Work boots are ideal and worn by most children in lieu of actual riding apparel. ASTM/SEI certified helmets are supplied. Project Soar is an adventure activity designed to challenge all age levels. A carefully planned obstacle course was created to encourage games of the mind. Highly qualified instructors assist the children on an individual basis as well as with group aptitude. Having been part of the camp curriculum since 1988, Project Soar was designed to reinforce important skills of team building, confidence, balance, and a challenge towards personal success. Since it’s inception, the camp’s ropes course has significantly expanded, adding new and increasingly challenging elements for all ages. The challenges the campers face at Project Soar are designed to strengthen each child's outlook of themselves. Older campers are really put to the test when they are ready both physically and mentally to tackle our 30 ft. climbing tower, super zip-line, multi-vine, and vertical pen to name a few. The ultimate goal is navigating a series of elements leading to the 875ft Field Zip Line. The camp is proud of it's advanced facility, with the very best equipment: Petzel helmets of all sizes for every camper, stainless steel carabiners, harnesses, and belay devices that are known as the best in the world among climbers. Adhering to the guidelines set forth by the American Red Cross, each staff member is required to obtain certification to become part of the PFDC pool staff. When the camper groups arrive at swimming they are subdivided into smaller groups which enables each instructor to focus on the skill development of your child thus creating an atmosphere for individual attention and progress. Campers attend morning swimming lessons which include all levels under Red Cross standards. Each child receives a certification card or progress chart at the completion of their session. We are also able to provide a second swim period where campers engage in organized games using noodles, kick boards, water balls, etc. Even though it is a non-instructional swim time, our Water Safety Instructor (WSI) staff are always available so children may use this time for additional help, practice strokes or even improve upon diving skills. Clever, experienced instructors inspire fascinating projects such a collage, print making, sculpture, painting, tye-dying, candle making, masks, puppets, multi-media, and recycled materials projects. The art program is designed specifically for each session, so that children attending more than one session do not repeat projects. Special surprise projects are frequently presented by outside professionals featuring multi-day guidance, resulting in expert quality crafts. Art is a quiet time that encourages dexterity and creativity while socializing with staff, Jr. Leaders and peers. All supplies are provided and major art projects are distributed at the sessions closing ceremony. This creative program includes outdoor environmental projects and games while encouraging and teaching ways to appreciate our habitat. The activities include but are not limited to: gardening, hiking, wilderness games, orienteering, animal/bird education and identification, survival techniques, and environmental issues. Hands on projects result in inventive crafts using a combination of natural products, many of which are collected on the property, i.e. broom making, potpourri, herbed sun tea, and hand-made paper, to name a few. The Nature Garden which is planted and tended by the campers has successfully produced an abundance of herbs and vegetables that are integrated into the Nature Program. Homemade Salsa and Vegetable Wraps are favorites from the vast assortment which have included: tomatoes, zucchini, peppers, cucumbers, potatoes, celery, corn, lettuce, broccoli, eggplant, swiss chard, green beans, and even strawberries! To flavor all these campers can harvest oregano, mint, basil, dill, and parsley. A smorgasbord for all! Archery provides a challenging and rewarding activity requiring concentration and a sequence of steps resulting in the ultimate "bulls eye". As part of our Nature activity, older children (approx. 8 yrs. old and up) will experience archery several days during their two-week session. Our professional director oversees the certified instructors, who coach the campers using high quality recurve bows, feathered arrows, protective arm guards and gloves and scorable targets. The range is designed to teach the fundamentals of archery for beginners, as well as to challenge the more advanced archers by varying distances and objects at which to aim. Our archery program follows the JOAD (Junior Olympic Archery Development) program of standards. If you are looking for a traditional sports program you will be surprised by what this activity is all about! Staff will concentrate on involving campers of all ages to increase their exercise levels in fun and fulfilling ways. No more sitting on the bench; this is a real life video game that will have the group running and laughing while playing some of their favorite games in unconventional ways. Anyone for a game of Quidditch? How about Frisbee Bowling? Campers will be surprised by the variety of choices from which they can choose for their daily activity all under the guise of FUN. It’s never too hot when there is water cannon target practice! We’ll keep the exercise stress free with noncompetitive rules. It’s like the days of neighborhood hide n’seek when everyone joined in and you made up the rules as you went along. What freedom for creativity that everyone will be able to enjoy!! Our theater program consists of talented, versatile staff who design unique programs that will cater to the varied age groups and interests of the campers. These resourceful instructors incorporate fascinating dances, songs or skits into the daily schedule depending on the groups suggestions and interests. Younger campers will concentrate on shorter, less involved skits whereas the older children may experience more in-depth programming. In addition to their daily theater games each group's specialized routine is practiced throughout the week. On the final Friday of each concluding session, these routines are presented by all the camper groups on the TDM stage at the sessions closing ceremony. Parents, grandparents, and friends are invited to attend these creative performances concluding with the distribution of camper certificates, Jr. Leader, Jr. Wrangler recognitions and staff introductions. A pleasant, constructive way for all to say goodbye to old and new camp friends. The Barnyard Buddies program is for children 4-6 years old as of January 1 or not yet in first grade. 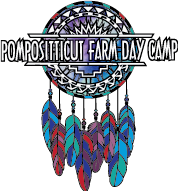 Participants are involved in the same activities as the Day Camp; however these may be modified to meet the needs of younger campers. Each of our daily activities foster learning new skills, practicing co-ordination, exercise and fun without the stress of competition. Lead by a Barnyard Buddies Director versed in childhood development, these younger campers are afforded additional individual attention and assistance for them to successfully complete a full day of activities. The ultimate goal of this introduction to camp is the cultivation of a sense of accomplishment, increased independence and self-esteem.